Janet Kurnatowski Gallery is pleased to present LEAN, new paintings by Scott Malbaurn. This will be Malbaurn’s third solo exhibition with the gallery. The exhibition dates are October 14 – November 13, 2011. Please join the artist for the opening reception on Friday, October 14th, from 7-9pm. What can it mean when an abstract artist describes his pictures as "nouns"--as "simple" nouns, no less? – Mario Naves, Artist and Writer contributes an essay to Malbaurn’s exhibition, LEAN. 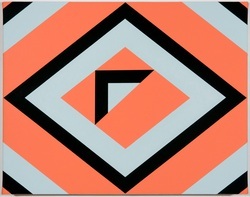 Malbaurn’s new series takes on the chevron, an iconic form that is no stranger to contemporary art. In an accompanying essay to the exhibition, Mario Naves writes, “Like any keen student of history, like any painter worth his salt, Scott Malbaurn works within the shadow of precedent and toward the less certain precincts of possibility. Mining high modernism for its rigor and clarity, Malbaurn uncovers nuances of pictorial form within circumscribed parameters. Make that seemingly circumscribed: Malbaurn’s recent explorations of the chevron are proof that a given motif is viable to the extent in which an artist endows it with newfound (or idiosyncratic) purpose”. More than homage, Malbaurn views his series as participation in the dialogue of hard-edged, reductive painting. From a recent experience at the Sol Lewitt exhibition at MassMOCA, the passing of Kenneth Noland and the constant sight of city chevrons found in D.O.T. street markings and road signs, as well as the backsides of ambulances and fire trucks here in NYC, the chevron has recently pervaded Malbaurn’s conscience. Through his personal use of the materials, we see Malbaurn’s vocabulary speak through his palette and sensibilities. Mario Naves continues to write, “Malbaurn layers innumerable runs of transparent acrylic to create luminous fields of off-key, all but un-nameable color—wan earthy yellows, bottomless reds, and blues as dense and clear as amber”. A chevron, in Malbaurn’s hands, is always itself and something else altogether--a noun encompassing meanings that go beyond even the artist’s ken. If that sounds like a tall order, well, it is—an order Malbaurn embodies to bracing effect. Scott Malbaurn received a BFA from the Maryland Institute College of Art and a MFA from Pratt Institute in 2004, both in Painting. Malbaurn has exhibited at Denise Bibro Fine Art, New York, NY, David Richard Contemporary, Santa Fe, NM, Central Utah Arts Center, Ephraim, UT, McNeil Art Group, New York, NY, and among others. Scott Malbaurn has curated exhibitions for Janet Kurnatowski, Brooklyn, NY, Denise Bibro’s Platform space, New York, NY, The Broadway Gallery, New York, NY, Landing Space, Brooklyn, NY and the H. Lewis Gallery, Baltimore, MD. Scott Malbaurn has had previous exhibitions reviewed in the Wag Mag and the Brooklyn Rail. Scott Malbaurn is a Professor of Drawing at Pratt Institute where he also holds the position of Acting Assistant Chair person of the Fine Arts Department. For more information or images please contact the gallery.